Newsflash for those of us who conceive of organic products as coming from the independently managed wholesome uncle John’s farm down the road. Apparently, for the most part, this could not be farther from the truth. Food conglomerates are jumping on the organic food trend now that it has been deemed no longer just a fad. People want natural organic whole some food, with millennials especially showing interest, according to the Wall Street Journal. … And don’t think that General Mills has not noticed. The majority of your beloved natural, organic and relatable brands are being bought up at amazing speeds by larger organizations such as General Mills, Hershey, PepsiCo, NestleSA and WhiteWave Foods, to name a few. In addition, it may come as no surprise to somethat many of the brands that are known for selling a handful of organic products are, for the most part not organic at all. 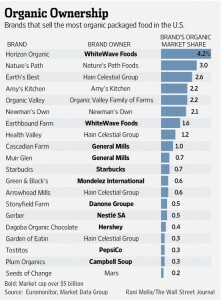 In fact, many of these brand owners are “traditional food processing companies with recent forays into organic brands”. So it comes as no surprise that these acquisitions tend to be kept rather quiet by the large food processing corporations. WhiteWave Foods recently acquired Earthbound Farms, giving it the largest market share value in the organic food industry at 4.2%. 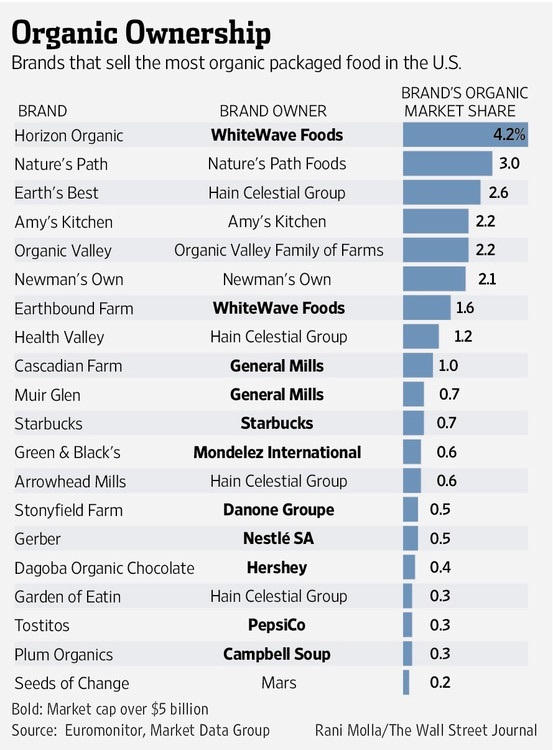 General Mills however, owns the most number of organic companies, however still pales in comparison and with regards to WhiteWave Food’s 4.2%. This may or may not come as a bit of surprise considering that the term “organic” is government certified. So consumers with a strong interest in strictly organic diets and supporting organic food production may want to beware of blindly trusting their food labels. Do your research –even more so when it comes to items deemed all “natural” –as according to food market analyst, Phil Lempert, there is currently no legal definition for such term, giving manufacturers wide wiggle room in terms of ingredients.